If your property is near a busy street or gets a lot of pedestrians or vehicle traffic in the evening, then professional, attractive lighting is not something that you can ignore. Because we want all property owners and managers to be as informed as possible in order to get the most out of their landscape, we compiled a list of why lighting upgrades are so important as well as a list of the most common types of outdoor lighting. We talk about slip and falls a lot when it comes to snow, but we don’t mention how often accidents can happen all year round just due to low visibility. 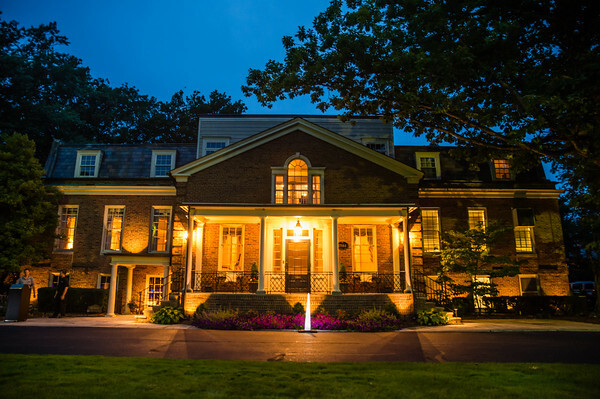 While some smaller properties can rely on streetlights to guide tenants and potential customers, most landscapes can benefit from additional lighting that makes people feel safe. Just like in the winter when surfaces are icy, elevated areas are especially vulnerable to accidents when people can’t see them properly. It’s important to make sure that sloped areas like hills, stairs, and ramps are all properly lit. And even if you have a property with primarily flat surfaces, it’s very important to have proper lighting. If you are sued because an accident or crime takes place on your property that extra lighting might have prevented, courts might find you negligent and therefore legally and financially liable. But liability issues aside, customers, employees, and tenants will enjoy your property when they feel safe on the premises. If you care about their experience, consider increasing the amount of lighting on your property to make them feel more comfortable. Adding the right type of lighting will make your property look better. Period. Do you have a sign, architectural feature, or even a group of plants on your landscape that you’re proud of? Lighting is great for highlighting the nicest parts of your property, making sure people pay attention to them 24/7. Spotlights on accentuate signs and decorative elements like wreaths and other holiday decorations. Up-lighting, which is simply light that points up from a floor or low surface, can be used to draw attention to walls, trees, pools, and patios. The Clifton Club, pictured left, is property that we service that makes excelllent use of up-lightining. Newer LED lights can also be changed seasonally with the use of colored coverings and filters, as well as with different colored bulbs. Certain systems can even be dimmed and change their color temperature with a remote control. With options like these, the control you can have over your lighting are endless. Landscape lighting is an investment that, when planned and installed correctly, can significantly increase your property’s value. Adding more lighting to an outdoor area on your property might encourage people to use it after the sun goes down. If you manage a retail park that closes around sunset, perhaps you don’t want people loitering around after hours. However, if you have a space on your property that you’d like people to utilize more, adding lighting can be the key to making a certain area seem more inviting. Want more landscape design ideas? Your lighting options are almost limitless, and there are so many different types of lights that it’s easy to feel overwhelmed. Below are some of the most common types of lights for commercial properties, as well as when you might choose them. Well lights are in ground lights that can be used to light anything from pathways and walkways to plants and architectural features. They’re also popular as up-lights to accent vertical surfaces like walls, doors, and signs. While they can be used to illuminate shrubs, well lights work best when they’re installed near taller plants that won’t grow close to the ground and overshadow them. Well lights are an easy way to highlight the nicest parts of your landscape and increase visibility, but they’re not ideal for every property. If you have well lights installed in a plant bed on a retail property, ground level lights probably aren’t in danger of being stepped on. But if you’re trying to light a park or a playground, for instance, then you might want to consider a lighting solution that’s less likely to come in contact with a lot of foot traffic. Spotlights and floodlights tend to be brighter than well lights and path lights, which can mean that they can be more dramatic as well. These two types of lights are similar, but spotlights tend to cast a beam that’s more focused, making them ideal for drawing attention to single features within your landscape, while flood lights are typically used to light wider areas like whole driveways and paths. Both of these types of lights can be used as up-lights or down lights depending on the location of what you’re trying to illuminate. Sconces, chandeliers, and other hanging lights are sometimes more ornate than other types of lights because they’re usually placed along the building’s exterior and other high traffic areas. 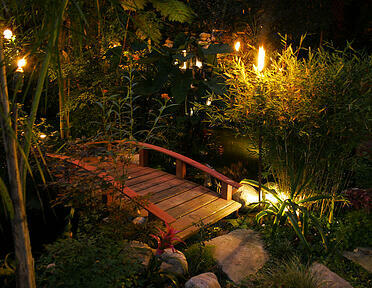 This means they can also be used to illuminate outdoor spaces in particularly beautiful ways. Upgrading to LED or solar lights: Is it worth it? If you have a lighting system installed on your property that’s more than 20 years old, there’s a good chance that they types of lighting being used are not energy efficient. LED and solar lights can cost more than their incandescent counterparts upfront to install, but that cost can generally be recouped over time in energy savings. Still on the fence about LED and solar lighting? A cost savings calculator like this one can help you determine just how much money you can save by making the switch. Sometimes the focal point of your landscape can change from season to season or from holiday to holiday. For property owners who want lighting options that are much more variable, solar lights can be a great option. “Off grid” solar lights, which (unlike hybrid options) only use the power they gather from ambient light, can often be moved anywhere on your landscape no matter their size. What about the cost of installation? Some property managers are hesitant to upgrade to LED lighting because they think their entire system will have to be rewired, but this often isn’t the case. 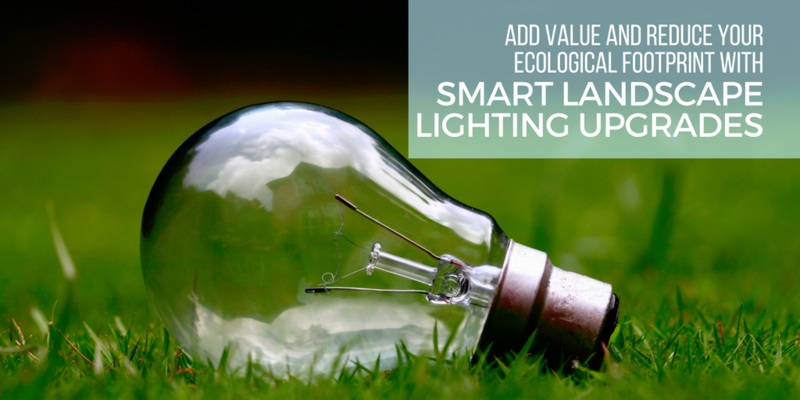 Frequently, we can simply swap out older bulbs for more energy efficient ones. But even replacing your entire system, which can be costly, is typically cheaper than the cost using seven to ten times more energy than you need. Sometimes significant landscape lighting upgrades are an investment that requires long term strategic planning and budgeting. The best grounds maintenance providers should be able understand your landscaping objectives and help you plan to achieve them, whether that takes months or years. 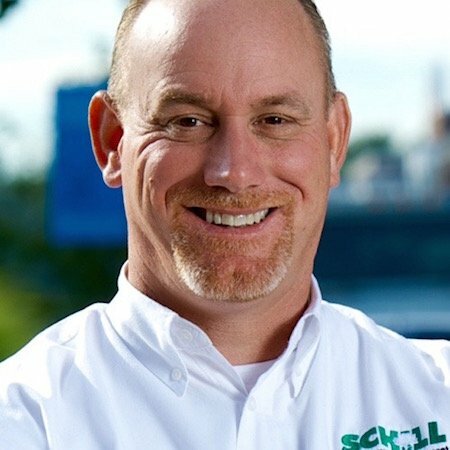 Here at Schill, love to talk with property owners and managers who have serious goals and are interested in transforming their landscape over time. If your lighting system is older, it may be running at 120 volts, also known as high voltage or line voltage. The bad news is that this is likely wasting a lot of energy (typically the only areas that need high voltage lighting are the ones that need to be heavily lit, like parking garages, for instance), but the good news is that you can sometimes save a lot of money by lowering that to 12 volts using a transformer. Using lower voltage is also safer for pets, who like to chew through things, and children on your property who may come in contact with exposed wires. It’s important that you work with a lighting professional who knows what types of lights to use to make your property look great all night. The team at Schill Grounds Management would love to help you get the highest energy savings and maximize your property’s curb appeal. If you’re in the Northeast Ohio area and you’d like a no-obligation consultation about lighting upgrades or landscape maintenance, feel free to drop us a line.